Of course, there have been some great songwriters—Dave Bartholomew, Art Neville, Earl King and Ed Volker immediately come to mind—but the game in New Orleans has been about music as a cultural continuum. One of the things that started to happen over the course of the last couple of decades in New Orleans is the emergence of a generation of great songwriters. Four of these writers have begun a collaboration that has already yielded some remarkable work. 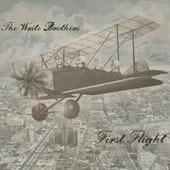 The Write Brothers are Jim McCormick, Alex McMurray, Paul Sanchez and Spencer Bohren. Their debut includes seven songs written together at Bohren’s house and one song written by each of them and sung by one of the others. As you might imagine, the songs cover a lot of stylistic ground coming from such seasoned and distinctive writers. What holds it all together is the brotherhood of singer/songwriters who frame their work on guitars, a bond that unites the hootenanny vibe of Greenwich Village basket house players with the windblown vistas of west Texas troubadours and the easygoing guitar pulls of Nashville cats. Those songs all include the presence of the elusive sauce as a cause for convivial behavior, but on the emotionally distraught tearjerker “Wedding Day” (Sanchez singing a McMurray song) the dram in question is a medicine that allows the singer to face that lonely TV set. The sense of loss in Sanchez’s voice here is hard to shake. There are several immediately recognizable classics here. “Borrowed Time,” written by Bohren and sung by McCormick, spins lines of Dante-esque predilection before smacking you in the forehead with an unforgettable chorus and moving through to the best electric guitar exchange on the album. This will expand into something even more in live performance. You will definitely be hearing this song again. “Jet Black and Jealous,” written by Sanchez and sung here by Bohren, has an inner tension that charges the hairs on the back of your neck with static electricity. And McCormick’s “New Orleans” (sung by McMurray) is the requisite statement of identity that distinguishes this bunch of slingers as the genuine Louisiana article. It’s an appropriate bonding device when you think that New Orleans natives McCormick and Sanchez both traveled north in search of something beyond their roots before realizing that New Orleans was the only place they could be themselves, while both Bohren and McMurray came to New Orleans and discovered their musical identity there. And of course, with such great storytellers in the house, there’s a worthy finale. “We’ll Be Together Again,” a whimsical, banjo-driven reminiscence about life on the Mississippi, ends the album on a quatro amigos note that is sure to become this wonderful collaboration’s calling card.